About the User: This project was commissioned by a client who provides tools for and information on the promotional gifts industry. Project Brief: To dynamically send emails using content from a blog and SQL Server Reporting Services reports on a scheduled basis via Microsoft Dynamics CRM. Collating articles from a blog of various types into an HTML email with headlines and links to the original article. Collating the list of recipients from Contacts in MSCRM. Attaching customer-specific PDF reports created via SQL Server Reporting Services. 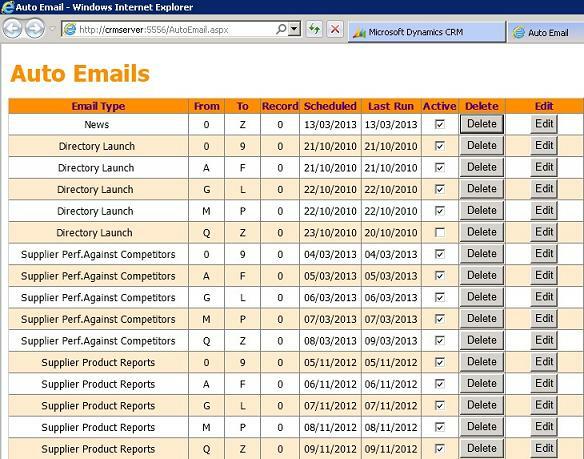 Sending the email and recording in MSCRM Contact History. Saves significant manual effort collating the articles, links, reports and list of recipients. Ensures a standard, consistent email format. Overnight schedule minimises server resource requirements during working hours. Increased traffic to websites and blogs through the easy-to-read summary email. Increased engagement of customers by providing relevant and informative information on a regular basis.